IronAxe is a high-end Physical Modeling simulation of one of the most popular and loved electro-acoustic instruments of all time : the Electric Guitar. 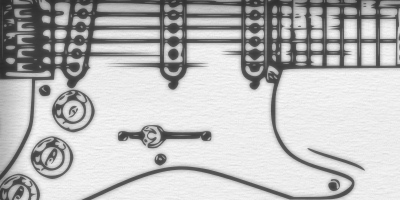 The result of many years of research and development, IronAxe reaches all the authentic beauty and expressivity of a real Electric Guitar by simulating the physics of all the acoustic and electronic components found in the original instrument, preserving the same nuances and multi-techniques playability impossible to perform on standard frozen-sounding sampled instruments. Break with the past - forget all the old, expensive, bulky sample libraries. With IronAxe you can build your custom Stratocaster©¹ or Telecaster©¹ guitar, choose Pickups type, number and position, set the Tone knobs to get the right sound, select the Plectrum hardness or pluck a String with fingers at any point along its lenght. Finally take real-time control of all this (and much more...) using a MIDI Keyboard or a real - natively supported - MIDI Guitar. Modeling Nature and Physics is a growing practice for reaching true-to-life systems simulations with 'alive' feedbacks, including complexity management and unpredictability integration. While in the past running an accurate Physical Modeling simulation was possible (due to its complexity) only on expensive multi-processor workstations or even computer clusters, today thanks to the exponential increase of modern CPUs' processing power, reaching parity with real instruments is possible in real-time (including polyphony and multi-istances possibilities) at a fraction of the costs. IronAxe is the first in a series of instruments developed by Xhun Audio to use this revolutionary technology. The core of this kind of approach is the interaction between the Instrument's model, the Performer's model and the Unpredictability simulation. All the six Strings, the Transducers (Pickups), the Plectrum/Finger excitation and more as well as Performer's actions like Palm Muting, Tapping Harmonics (even muting a String after its excitation is possible) are physically simulated. Add Unpredictability (instrument's and performances' micro-imperfections) to the equation and what you hear at the end of the whole process is given by the interaction of this three worlds. The result is an 'alive' instrument, a state-of-the-art simulation for an unparalleled realism. Audio demo made using exclusively IronAxe version 1.0 (for the guitar tracks). No external processing is used. Performed using a MIDI Keyboard.